Taiji classes at the Thunder Bay 55 Plus Centre begin week of April 7 and continue for 8 weeks. This class is a good introduction to Taiji and Qigong but will also enhance the health benefits of those who already practice Taiji. This new class encompasses unique whole body moves, along with warm up and cool down routines. Taiji Qigong is a combination of the ancient Chinese forms of Taiji and Qigong. Mental concentration and calmness are developed as one practice’s these forms. They can also be done standing or in a seated position. Tai Chi is the centuries old Chinese art of moving meditation; with slow controlled movement. 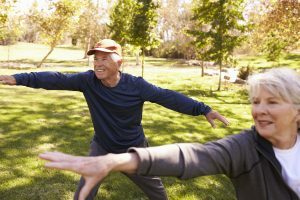 This class includes gentle exercises using Tai Chi movements that can be performed either seated or standing. Helps to improve mental & physical balance; increase & maintain range of motion and improve flexibility and co-ordination. We learn to link together a series of gestures called forms, that cultivate our ability to move easily in any direction, to have better balance, more strength and greater range and ease of movement. Some aspects of the lessons are more meditative (Qigong) and we work together in a friendly inclusive atmosphere. We link together in new patterns the movements learned in 8 and 16 Forms and add new gestures that expand the repertoire of ways of moving. 24 Forms is perhaps the most widely known Taiji form in the world. We continue to rehearse the 8, 16, 24 & 48 Forms, to clarify and deepen our understanding of the inner awareness that results in beautiful, flowing and powerful movements. Focus will be on 48 forms. The Peng You Taiji Quan Association has been a community of people who have been “playing” Taiji together in Thunder Bay for more than 20 years. The motto is “Health, Friendship and Happiness”. Major accomplishments have been the hosting of an international gathering of Taiji grandmasters – the leaders of the major Taiji schools – The International Forum on Taijiquan 2006. The second accomplishment is creating the “International Taiji Park” in Marina Park. The Association was founded by Master Peng You who has been a dynamic representative of Taiji in Thunder Bay, Canada and China. I am grateful that his enthusiasm, persistence and friendship got me hooked into doing and teaching Taiji. It has proved an important way of keeping me healthy and a source of great pleasure in my life. Information about Taiji classes at Master Peng’s Tai Chi Academy. Dr. Yang Yang has been the other major influence in my study of Taiji. His book, Taijiquan; The Art of Nurturing the Science of Power is an elegant presentation that brings together traditional Chinese taiji theory with the western scientific perspective of a PhD in Kinesiology. I recommend this book for anyone who wants to understand more of the ideas behind taijiquan.